I bet you remember rockpooling as a kid trying to catch prawns and crabs. Today in summer, children line harbour walls catching crabs in drop nets. All good fun, but for most of us, this is something we stop doing when we grow out of short trousers. Such a shame when the seashore offers the most exciting foraging there is. Yes, exciting but also potentially dangerous, from landslides to shellfish poisoning, but if you are aware of the risks and take care the seashore can offer a wealth of fantastic wild food. You can find a range of plants that - like the seashore - and can tolerate salty conditions. These include wild vegetables, such as Sea Beet and Marsh Samphire and wonderful Sea Buckthorn berries. Seaweeds are widely used in Oriental cuisine and popular in Ireland and western Britain, but relatively few of us have knowingly eaten them. There are around a dozen species commonly eaten, and the key is cooking them appropriately as each demands different attention. With skill (and luck) you can also find shellfish such as cockles, mussels, clams, crabs, prawns and shrimps. Finally, the coast is also a great place for fungi with the milder conditions and less intensive agriculture giving ideal hunting grounds. As with any foraging, safety is critically important; never eat any plant or mushroom unless you are absolutely 100% certain of its identification and edibility. 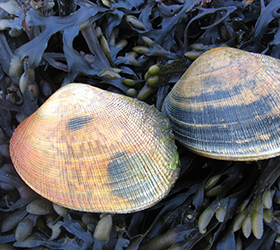 You should be familiar with relevant laws and bylaws and should always forage sustainably, such as observing shellfish minimum sizes. Courses and books are a good way of getting started. Join Hedgerow Harvest for seashore foraging walks on the Dorset coast on 27th September. Find more information or book places at http://www.hedgerow-harvest.com/courses_seashore.html.